Is SIP available for all mutual funds of IDLC AML? So, Y ended up with more units as his average cost reduced to BDT 11.12 as over a period of time market fluctuations are averaged. How to invest in SIP of IDLC AML? What is the difference between other monthly savings schemes and “SIP”? What happens after SIP maturity? Scenario 1 - Auto-renewal: If investor selects the auto-renewal option in SIP section of the application form, then installments will continue until further notice from the investor. Scenario 2 – Surrender: If investor does not want to renew the SIP after maturity, then the matured amount will be kept in his / her BO account or transferred to the investor’s bank account as per his / her choice mentioned in the Application Form. Scenario 3 – No Auto-renewal and No encashment/redemption: If investor does not want to renew the SIP after maturity but wants to remain invested, then the matured amount will continue as a NON-SIP scheme till surrender. In this case, the investor will not have to pay a fixed amount on a monthly basis as the matured amount will be invested as a lump sum amount till he/she decides to surrender the units. What is the maximum amount of installment under direct debit facility? The maximum amount of SIP installment is BDT 1,000,000 per registration for individuals. There is no maximum limit for institutions. How to discontinue the SIP? To discontinue the SIP, the investor must provide an application to the Asset Manager at least 5 working days before the next Installment Date. Will there be any fees and/or penalties for discontinuing the SIP before maturity? No, there are no fees or penalties for discontinuation. What if investor defaults on their auto-debit payment? There are no penalties for default. However, the default of 2 (two) installments will result in discontinuation of SIP. If investor wants to continue his SIP again, he/she will have to re-register as a new SIP account. What if investor wants to top-up his/her installment amount? The investor can top-up his / her installment amount for maximum 2 times against the same registration number. In that case, the investor has submit the revised “Auto Debit Instruction Form” authorized from his / her bank having the same maturity date as mentioned earlier. Can the investor provide 2 different bank accounts for top-up? Yes, the minimum investment amount is BDT 1,000. Is there a minimum lot size for SIP? There is no minimum lot size of units under the SIP. Any fraction amount remaining will be converted when it sums up to one unit. If at surrender, remaining amount does not sum up to 1 unit then the remaining amount will be transferred via BEFTN. What are the payment options for SIP? Payment in respect of the first installment can be made using a cheque / Pay Order / Demand Draft. The payment for all the subsequent installments will have to be through Direct Debit facility/Auto-Debit/standing instruction facility as provided by the investors. What is Direct Debit facility/Auto-Debit/standing instruction? An arrangement made with the bank that allows IDLC to transfer a fixed amount (as instructed by investor) from investor’s account on an agreed date. Can investor change his/her bank account information before the maturity of the SIP? Request for change in bank account information should be submitted at least 5 working days before the next installment date. Can the investor pay a lump sum amount in advance? No, the investor cannot pay a lump sum amount in advance for SIP. He/she will have to pay a pre-determined fixed installment every month at the investor’s discretion. Does SIP allow partial surrender? Yes, investor may surrender his/her units partially and continue SIP installments till maturity. When will the auto-debit occur? 7th of every month. If the investor defaults on that day, the auto-debit will occur on 15th of that month at the prevailing NAV of that week. What is the purchase price for SIP? Purchase Price will be valid from Sunday to Wednesday. However, if the 7th or 15th is a Thursday, investors will be able to avail on the prevailing purchase price of that particular week. What happens if the 7th or 15th of the month is a weekend and/or holiday? Auto-debit will take place on the following working day on that week’s purchase price. Does SIP allow investments from joint investors? Does SIP allow investments from institutional investors? Yes. Minimum installment is BDT 10,000. Can investors register for both SIP and NON-SIP accounts for mutual funds of IDLC? Yes with two different registration numbers. Can investor register for separate SIP accounts for more than one mutual fund of IDLC? Can investors switch SIP installments between different mutual funds of IDLC? No, investors must surrender current SIP account and register again for his/her preferred mutual fund. Will the investor receive annual dividends (if declared) before maturity of the SIP? Yes. Cash or reinvestment units as preferred by the investor. Source: Page 601-602, Chapter 9, Section: Securities & Exchange Commission (Mutual Fund) Rules 2001. A commission fee applied when initially purchasing units in a mutual fund, which is deducted from the total investment amount. There is NO front-end load for mutual funds of IDLC making it most-beneficial for the investors. A commission fee applied when redeeming units from a mutual fund, which is deducted from the total investment amount. There is NO back-end load for mutual funds of IDLC making it most-beneficial for the investors. Both Individual (singly or jointly) and Institution (local and foreign) can invest in a mutual fund. In addition, other mutual funds and collective investment schemes can also invest in a mutual fund. HOW TO INVEST IN MUTUAL FUNDS OF IDLC? Please note, all documents / photos should be signed by the applicant. HOW DO I KNOW WHERE MY MONEY IS BEING INVESTED? How do I receive returns from a Mutual Fund? How do I deposit my money to invest in a Mutual Fund? Investor can submit the money (cheque / pay order / demand draft) to the head office of IDLC AML or any selling agent as appointed by the Asset Management Company. The investor can directly deposit / BEFTN the fund in the designated bank account of the mutual fund. Do I need a BO account to invest in a Mutual Fund? Yes, it is mandatory to have a BO account as units of the mutual fund will be credited to the designated BO account of the unit-holder. Can I open BO account? To open an account with IDLC Securities, the opening fee is BDT 500.00 and the annual fee is BDT 500.00. However, there is no BO account opening fee for existing account-holders. Is there a lock in period for my Investment? No, there is no lock-in period in the investment of the mutual fund. Is there any transferability option for my Investment? The units can be transferred from one unit-holder to another through the Asset Management Company. Is it Mandatory to have an E-Tin Certificate? No, it is not mandatory to have an E-TIN certificate. However, the unit-holder having E-TIN Certificate will have to pay only 10% tax (AIT) against dividend income. On the other hand, the unit holder who doesn’t have any E-TIN will have to pay 15% tax against dividend income. Is there a Monthly Deposit Scheme? Yes, there is a monthly deposit scheme for the mutual funds managed by IDLC Asset Management Company which is known as SIP (Systematic Investment Plan). WHAT IS THE MINIMUM AMOUNT ONE CAN INVEST? The minimum amount to invest in our mutual fund is 500 units for individuals and 5000 units for institutions. In terms of taka, the amount is equivalent to 500 OR 5000 units x Investor’s Buy Price. Investors must also purchase units in increments of 500. For example: If the Investor’s Buy Price is BDT 10.06, the minimum amount one can invest = BDT 10.06 x 500 units = BDT 5,030. Please note there is no maximum purchase amount as investors can purchase infinite units in multiples of 500. What is an Investor’s buy Price? The price or NAV an investor can buy units of an open-ended fund is called an investor’s buy price. What is an Investor’s Sell Price? The price or NAV an investor can repurchase or sell units of an open-ended fund is called an investor’s sell price. 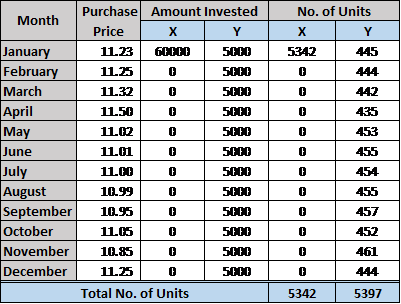 Can I buy Mutual Fund units after the IPO? Yes, investors can buy units after IPO. 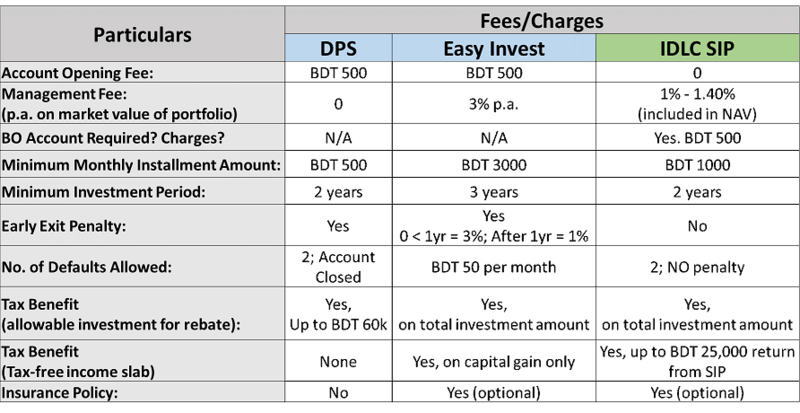 The difference is that during IPO investors purchase units at face value, which is BDT 10.0, whereas, after the IPO closing, investors purchase units at the investor’s buy price declared by the Asset Management Company. What is the minimum investment amount during IPO? What is the Minimum Investment amount after IPO? How long do I have to wait to receive my money against sales proceeds? The sale proceeds will be credited to the bank account of the unit-holder within 7 working days after surrendering the units. Please ensure the submission of Surrender Form (to the Asset Manager) and CDBL Transfer Form (to the designated Broker House) to complete the Surrender Procedure. Refer to http://aml.idlc.com/forms.php for all forms. DO I RECEIVE PROOF OF PURCHASE AFTER MY INVESTMENT? Yes, an acknowledgement slip will be provided while you submit the “Purchase Form” along with the cheque. A “Confirmation of Unit Allocation” will be issued in favour of the unit-holder after crediting the units to the BO account of the unit-holder. 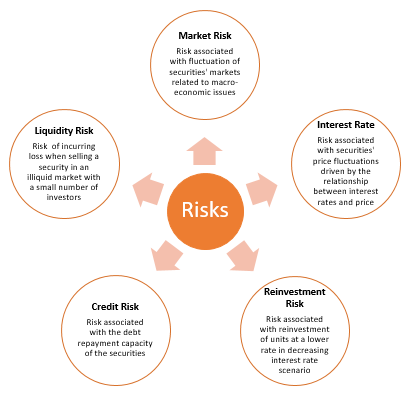 What are the different types of risk involved in investing in a Mutual Fund? How long do I have to wait to receive dividend against my investment? The dividend (Cash / Reinvestment Unit) will be credited to the Bank / BO account of the unit-holder within 45 days after declaration of dividend in the trustee meeting. WHERE TO INVEST IN MUTUAL FUNDS OF IDLC? Investors can subscribe/purchase the units of mutual funds of IDLC through any of the IDLC branches listed on our website or through designated Selling Agents of IDLC. To learn more, please contact us via call center (16409) or “Invest Now” option provided in the website. FOR HOW I LONG DO I NEED TO REMAIN INVESTED IN THE FUND? You can invest or withdraw any time by buying or selling the units at NAV per unit at no additional fee. This provides flexibility to the investors in terms of liquidity. 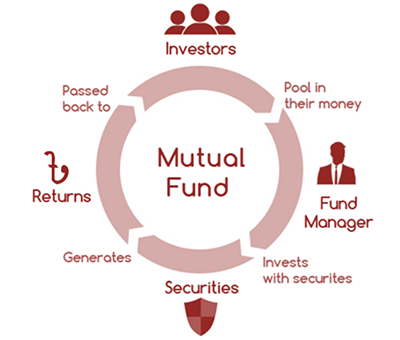 Mutual fund is a professionally managed investment vehicle that pools money from many investors to invest in securities such as stocks, bonds, money market instruments and similar assets across a wide range of industries and sectors. Mutual funds are managed by professional asset managers to attain the investment objectives of the investors of the fund. Open-end – A type of mutual fund that does not have a maturity period so investors can buy and sell units through the asset manager on a continuous basis. There are also no restrictions on the amount of shares the fund can issue. Close-end – A type of mutual fund that has a fixed maturity period and issues a fixed number of shares during a certain period at the time of launch. Investors can invest in the fund at the time of the IPO and thereafter, they can only buy and sell units in the capital market. How have Mutual Funds Evolved? The arrival of the modern day mutual fund was marked by the creation of Massachusetts Investors' Trust, in Boston, Massachusetts, USA in 1924. Since then the industry has evolved at a stunning pace with introduction of different types of mutual funds catering to the investment goals of people. Mutual fund has become one of the most popular investment vehicle of modern age around the globe with a total asset under management of USD 74.0 trillion worldwide. In Bangladesh asset under management is currently USD 1.2 billion, while it is USD 333.2 billion in our neighboring country India, which shows our growth potential. What are the common benefits of investing in a Mutual Fund? 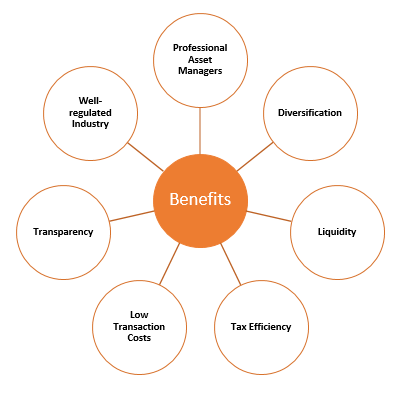 Access to professional asset managers – Investors’ money is managed by experienced and knowledgeable asset managers using fundamental and technical analysis. Diversification – Diversification allows investors to invest in a number of companies across a wide range of industries and sectors, which in turn minimizes risks. Individual investors with a small surplus can diversify their funds only through mutual funds, which would not have been possible otherwise. Liquidity – For open-ended funds, investors can buy and sell units on a continuous basis so they can liquidate their investments at any time. Tax Efficiency – Investors are eligible for tax rebate depending on the amount invested. Asset Management Companies are required to distribute a percentage of the earning (refer to fund-specific prospectus for exact %) as dividends to investors, out of which up to TK 25,000 is tax-free. In addition, profits generated by the mutual fund are also tax exempted. Low transaction costs – By investing in a Mutual fund, investors invest in a wide range of instruments – various securities, bonds, debentures and other money-market instruments such as FDR, etc. all at once. Therefore, as they are investing collectively, they do not need to pay taxes or other fees/charges separately for each instrument which leads to overall lower transaction fees. Transparency – Investors have access to the value of their investment on a weekly basis. The portfolio is also disclosed quarterly with the asset manager's investment strategy and outlook. In addition, the prospectus discloses all other necessary information in details. Well-regulated industry – All mutual funds must be registered with Bangladesh Securities and Exchange Commission and they function under strict regulations designed to protect the interests of investors. What is the return that I can expect? A: There is no guaranteed percentage of return. Empirically, it has been observed that mutual funds can generate higher return than all other asset classes in the long run. How can you guarantee profit when the market in Bangladesh is volatile? Profit is not guaranteed when investing in IDLC Balanced Fund. However, mutual funds can generate better returns in the long-run even in volatile markets leveraging professional fund management skills. What do you mean by expert fund manager? A: An expert fund manager is a skilled professional capable of generating better returns and managing risks through dynamic asset allocation. Who is the regulatory body for Mutual Fund? A: Bangladesh Securities and Exchange Commission (BSEC) is the regulatory body of Mutual Funds in Bangladesh. What are the key parties related to Mutual Fund? Sponsor: The sponsor initiates the mutual fund by subscribing minimum 10% of the total fund size. The Sponsor appoints the trustee, Custodian and the Asset Management Company. Trustees: The board of trustees are responsible for protecting the interests of the unit holders. It is an independent body having received the trusteeship license from the regulator and is not associated with the Sponsor or the Asset Management Company. Custodian: The custodian is responsible for physical handling and safe keeping of the assets managed by the Asset Management Company. They receive the Custodian license from the regulator and are independent of the Sponsor or the Asset Management Company. Asset Management Company (AMC): The Asset Management Company is responsible for floating and managing the mutual funds in accordance with Bangladesh Securities and Exchange Commission regulations and guidelines provided by the Trustee. Can the NAV below the face value of my investment? A fund’s NAV goes up or down depending on change in market value of the assets held by the fund. Therefore, if the market value of the assets falls substantially, there is a chance of the NAV going below the face value of the fund. However, such events are expected to be temporary as NAV is projected to grow in the long term with expert asset management. Is IDLC Balanced Fund halal? IDLC Balanced Fund does not follow any such specific Shariah law or policy. Is there any entry or exit fee? There is no entry or exit fee. Shares which represent the extent of ownership in a mutual fund is called a unit. Investors can purchase or redeem units at the fund’s current Net Asset Value (NAV) per share. HOW OFTEN WILL THE NAV OF MUTUAL FUNDS OF IDLC BE DECLARED? The NAV of all mutual funds of IDLC is declared on Sunday every week on our website, via SMS and in Financial Express.